Where can I find Goliathcasino’s bonus policy? How does Goliathcasino protect my Privacy? Who is the governing body of Goliathcasino? How do I know if Goliathcasino is playing fair? Where can I find Goliathcasino’s cash out policy? Where can I find Goliathcasino’s terms and conditions? How do decimal odds work? How can I change the Odds format? Where can I find the rules for the different type of sports and how to bet on them? How do I know what needs to happen for me to win a certain type of bet? How do I place a bet on Sports? How do I place a livebet ? I made a mistake when placing a bet! Can I cancel my bet? Where can I see my already placed bets and how do I find out if my bet won or lost? When will my bet be settled and I can get my sports Winnings? What happens if the match is postponed or cancelled? Why was my sports bet voided? What are the Betting Stake Limits in sports. How can I place a bet above the maximum amount? Where and how can I cash out my bet? Does the Cash Out amount include my stake? Why wasn't my Cash Out successful? When do I get my money after Cash Out? What type of bets can be Cashed Out? I have placed a combination bet, 4 out of 5 selections have won, can I cash out my bet? Can I use both the Casino and Sports Welcome bonuses? What is a Risk Free Bet? Where can I find my Risk Free Bet? How can I use my Risk Free Bet? Where can I find my placed Risk Free Bet? Why didn’t the option to choose the Risk Free Bet appear in my bet slip? Can I bet risk free without choosing the risk free bet on the bet slip? What happens if my Risk Free Bet is settled as a win? What happens if my Risk Free Bet is settled as a loss? Can I split my Risk Free Bet over several bets? Can I use my Risk Free Bet to contribute for another bet? Can I bet risk free a lower amount than my Risk Free Bet? Can I use my Risk Free Bet on any device? Can I use my Risk Free Bet on pre-match and live betting? On what sports or leagues can I use my Risk Free Bet? Can I CashOut my Risk Free Bet? How do I know if I’ve qualified for a free bet? Where can I find my placed Free Bet? Why didn’t the option to choose the Free Bet appear in my bet slip? What happens if my Free Bet is settled as a win? What happens if my Free Bet is settled as a loss? Can I split my Free Bet over several bets? Can I use my Free Bet on any device? Can I use my Free Bet on pre-match and live betting? On what sports or leagues can I use my Free Bet? Can I CashOut my Free Bet? The 100% matchup bonus is something that Goliathcasino offers to all its new players. To claim this bonus all you need to do is make your first deposit of a minimum of $10. Goliathcasino’s bonus policy can be found here. Any bonuses added to your account are usually added automatically if a promotion is running during that period. It may also have been credited to your account by your Personal Account Manager either following a personal bonus offer or as a thank you gesture for your continued loyalty to us here at Goliathcasino. If you do not wish to take advantage of the bonus offer please do not play with the deposit and bonus funds at all and contact us straight away. It may take up to 5 days for our processor to receive the funds. Immediately upon confirmation from our processor, we will update your account balance and we will notify you by e mail that your playing balance has been updated with the deposited funds. If after 10 business days from making the wire transfer, you still have not received the funds in your Goliathcasino account, please contact our customer support team for further assistance. Kindly make sure you prepare all relevant details of the deposit made (Date of transaction, amount, currency, transaction reference number from bank). Goliathcasino’s cash out can be found here. The funds will now be transferred back into your Goliathcasino account. 1. 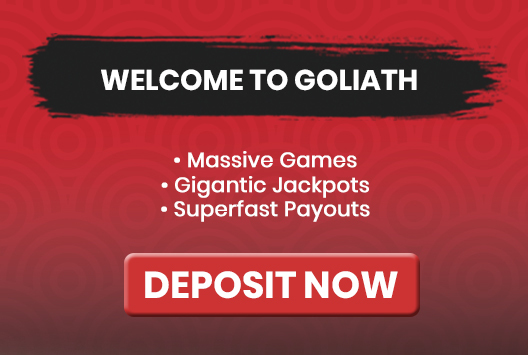 Login to your Goliathcasino Account and click on “My Account”. Select “Documents Upload“. Reward Points are another way for Goliathcasino to reward our loyal players. Registered Goliathcasino Real Money players earn Reward Points as they play. Reward Points may be awarded for special promotions or as gifts from Goliathcasino. Bonus Money redemption is done from the cashier section of the Goliathcasino site. If a player chooses to close their Goliathcasino account, they will forfeit their Reward Level and lose all Reward Points associated with that account. In the event of account closure by Goliathcasino for any reason, Reward Levels and Reward Points will be forfeited. It is possible to earn Reward Points on the Mobile platform as well as through web games on Goliathcasino. Goliathcasino Mobile Players earn points in exactly the same way. Goliathcasino’s terms and conditions can be found here. Sports betting is the activity of predicting sports results and placing a bet on what will happen.Apart from placing bets on sports, you can also bet on a variety of different events, for example, television events or presidential elections, sometimes you can even bet on the weather! Decimal odds are super simple once you've got the hang of them. Basically, you multiply your stake by the decimal shown(an odd) and the answer is how much you'll receive in winnings - including your stake. E.g. If you have odds of 5.00 and stake $1, you'll receive $5 in winnings (including your returned stake). Odds do fluctuate(increase or decrease) much like shares on a stock exchange! However, when your bet has been approved, the odds stated at the time (once selected) will remain valid, unless inserted by mistake. On your laptop, select the dropdown menu on the right hand side that is and choose between, Decimal, Fractional or American odds format. On your mobile: Go on the sports home page, in the middle in grey navigation boxes you will see these options : A-Z , Football , KaramBot , Tennis etc ..., If you slide your finger to the left side meaning that you are going to scroll sideways to the right side you will see the option 'Settings', you will be able to change the Odds Format from ‘Odds style’. "Definition: A single bet is the simplest type of bet. A single bet is a prediction about one single event. You can place this kind of bet on all the events offered. Placing a single bet: Bet on the final result (1 - X - 2) of the match between Real Madrid and Manchester United. By betting on the final result of the match, you have the possibility to select one of 3 potential results: - 1: A win for the home team. - X: A draw. - 2: A win for the away team. Let’s say you decide to bet on a win for Real Madrid at odds of 2.00. By clicking on odds of 2.00, your selection will be displayed automatically on your betting slip on the “Single” tab. Now, you are able to set the amount you wish to bet using your keypad (in this example it is $5). Once your bet amount is indicated in the box provided, a summary of your bet will be displayed (Number of bet(s): 1 / Stake $5 / Winnings: $10). Winnings: Your bet is considered a winning bet if your selection is correct. You will win the amount of your bet multiplied by the event odds you bet on (in this example, a bet of $5 times a selection with odds of 2.00 = $10). Options: It is possible to place several single bets using the same betting slip. In order to do so, you just need to select more events. Once you have decided on your selection, click on the “Single” tab. Now, your selections are independent of each other. You can now choose different bet amounts for each of your selections using the white boxes next to each of your selected odds, or bet the same amount for each of your selections by using the box next to the text “Stake per bet”. "Definition: A combo bet is a combination of a minimum of 2 selections. By choosing to place a combined bet, you increase the amount of your potential winnings. In essence, the odds corresponding to your selections are multiplied by each other, thus allowing the total odds on your betting slip and consequently your potential winnings to increase. You can combine as many selections as you wish as long as your potential winnings do not exceed the fixed winnings limit. Placing a combo bet: Bet on the final result (1- X - 2) for the following matches: - Chelsea vs. Tottenham. - Paris St.Germain vs Borussia Dortmund. - Liverpool vs Arsenal. By betting on the final result of the match, you have the possibility to select one of 3 potential results: - 1 : A win for the home team.- X : A draw.- 2 : A win for the away team. Let’s say you decide to bet on combined victory for Chelsea, Paris St.Germain and Liverpool. By clicking on the odds corresponding to wins of Chelsea, Paris St.Germain and Liverpool, your selection will display automatically on your betting slip on the “Combo” tab. Now, you are able to set the amount of your bet (in this example it is $60). Once your bet amount appears in a white box marked with an asterisk, a summary of your bet will be displayed (Number of bet(s): 1 / Stake $60 / Winnings: $29.85). Winnings: Your bet is considered a winning bet only if all the combinations are correct. In this example, your bet wins if Chelsea, Paris St.Germain and Liverpool win. If such is the case, you will win X amount (E.g. : A $60 bet on total odds of 1.95 × 1.90 × 2.30 = $42.60). Important information: Some selections that appear on your betting slip cannot be combined. The main reason for this is that it is impossible to combine 2 or more selections on the same event in the same combined bet. As soon as you have entered at least three or more picks (up to eight) on the bet slip, you can place a system bet. To do so, click on the “System” tab at the top of the bet slip. The number of possible system bets depends on the number of predicted outcomes. The system bets possible with your picks will be displayed automatically. Each possibility is accompanied by an info button that you can click on for more info about the principle underlying the relevant system bet. The main difference between system bets and multi (parlay) bets is that you can win a system bet even if not all your picks are correct. For example, in the case of a 2/3 system bet, you win even if only two of your three predictions turn out to be correct. Please note that the amount of possible winnings displayed when you place your bet corresponds to the maximum winnings, i.e. in the above example, they payout if all three of picks are correct. In a system bet, combinations of picks are formed. Live betting is when you place a bet on an event that has already started! Live betting markets become available immediately after the event starts. It is the same as placing a normal bet apart from one aspect: Compared to betting before the match, there is always a small 5/10 seconds delay on live bets to safeguard the product from transmission delays and big/sudden impacts during the event. Almost all of the Bet Types will be available before the match will be available to bet on after the match has started! Cashing out a bet that you have placed before the match started is also possible! In addition to this we also have Fast Markets! See full description here. But basically you can bet on if there is a Goal/Corners/Cards/Free Kick/Throw/Goal Kick/Penalty within the next minute or within the next 5 minutes! Action all the time in other words!! Once a bet is placed, it can’t be cancelled. Please be very careful when placing bets. Most bets will have Cash out options available should you wish to cash-out. Your bet will be settled, and winnings paid out, as soon as the event that you have bet on has finished. Please refer to our betting rules by clicking here for further information. There are various reasons why a bet may be declared void. This could happen if your bet was accepted at an incorrect price or after the event had started. There are sport-specific reasons too, for example in tennis your bet is void if a player retires before completing the first set, or in football if the match is abandoned.All bets declared void will be settled with the odds of 1.00. Full details on voided bets are available in our Terms and Conditions. The minimum that you can bet is £0.10, €0.10 or 1.00 for all other currencies.The maximum stake will vary for different bets(Sports, League, Type of Bet). If the stake you enter on the betting slip is above the maximum stake you will be given a few options. You can either reduce your bet to the maximum stake or request that your entire bet is accepted. In order to place a bet above the maximum amount, just enter the sum you want to bet, and when you click PLACE BETS this will be referred to a trader, who will get back to you really quickly with a decision. If the bet cannot be fully accepted, our traders will usually offer you some of your bet and sometimes at different odds. Then it’s your decision whether to accept or decline the counter offer. The Cash Out feature allows you to secure profit or minimize losses from your bets by cashing out before the even has finished! Go to the Bet Slip and the Cash Out tab via Desktop or Mobile. Every open bet with the Cash Out feature available will have a Cash Out button. To Cash Out your bet simply click on the button. The Cash Out amount is the total amount that will be returned to your account if the Cash Out is successful. Cash Out offers are not guaranteed. If there is a sudden large movement in market prices, your Cash Out may be unsuccessful. If your Cash Out is successful you will see a Success message. If your Cash Out fails, you will see a Failure message, and a new offer will appear. When a Cash Out is successful, any returns are credited to your betting account INSTANTLY! The Cash Out feature is available on both single and combo bets. It is available on all Sports and Bet types Except for : Forecast/Tricasy, Asian Handicap and System Bets. If all the markets in the combination bet are available for cash out, YES YOU CAN! A risk free bet allows you to bet risk free. All you have to do is cover the value of your risk free bet with real money and you’ll get it back if you don’t win. 1. My Account on the left hand menu. 2. Below the Goliathcasino logo on Bonus Bets. Simply make your selections, add them to your bet slip and choose to use your risk free bet before placing your bet. Just like all your placed bets, it will show in your “Open Bets” until the risk free bet is settled. After that, you’ll be able to check your risk free bet details in your “Betting History”. Make sure you have met all the offer requirements to get and/or to be able to use your risk free bet. Check that your selections on your bet slip are in line with the offer. The option to use the risk free bet will appear as soon as your bet slip is correct. If you are still experiencing problems with placing your risk free bet don’t hesitate to contact our excellent customer support. No, you must select the risk free bet for your bet to be risk free. If not, the bet is just a normal bet and if you lose you won’t get your money back. Any winning from the risk free bet are real money with no wagering requirements. The entire value of the risk free bet will be returned to your account with no wagering requirements. No, you can’t split your risk free bet. You can use your risk free bet on singles and combos. In fact, combos are a great opportunity to increase your potential winnings since the bet is 100% Risk Free. However, you cannot place system bets with a risk free bet. Yes, you can place a risk free bet along with a normal bet. For example, you can use a $10 Risk Free Bet to contribute to a $60 bet. This means that $10 are risk free. Yes, however, the remaining amount of the risk free bet will be forfeit. For example, if you place only $10 risk free on a €100 risk free bet, the remaining €90 will be forfeit. It depends on the specific offer. Risk free bets can be available exclusively on mobile, desktop or both. Once again it depends on the specific offer. Risk free bets can be available exclusively for pre-match, live betting or both. Risk free bets can be offered on all kinds of different sports and leagues. Just check your offer and where you can use it. No, you can’t use the CashOut feature for risk free bets. Free Bet allows you to place a bet without investing any money. The full amount of the free bet is covered by Goliathcasino. To see whether you currently have any free bets available, simply click on “My bonuses” in the “My account” or check for “Bonus Bets” at the top of the page below the Goliathcasino logo. You’ll be able to see which free bets you’ve qualified for, details of what you can use your free bets on and the expiry date. This page will also list free bets you’ve used and any that have expired. Simply made your selections, add them to your bet slip and choose to use your free bet before placing your bet. Just like all your placed bets, it will show in your “Open Bets” until the free bet is settled. After that, you’ll be able to check your free bet details in your “Betting History”. Make sure you have met all the offer requirements to get and/or to be able to use your free bet. Check that your selections on your bet slip are in line with the offer. The option to use the free bet will appear as soon as your bet slip is correct. If you are still experiencing problems with placing your free bet don’t hesitate to contact our excellent customer support. Only the winnings from the free bet will be credited to your account. There are no turnover requirements for free bet winnings. It won’t affect your current balance since Goliathcasino covered all the stake. No, you can’t split your free bet. You can only use your free bet on singles and combos. It depends on the specific offer. Free bets can be available exclusively on mobile, desktop or both. Once again it depends on the specific offer. Free bets can be available exclusively for pre-match, live betting or both. Free bets can be offered on all kinds of different sports and leagues. Just check your offer and where you can use it. No, you can’t use the CashOut feature for free bets.